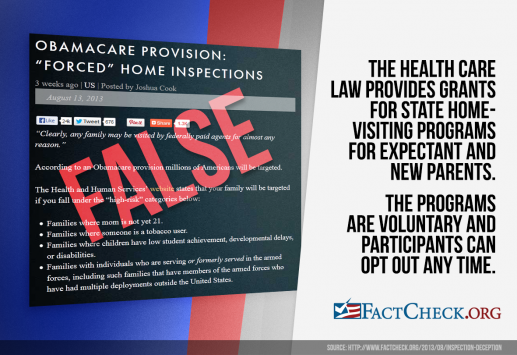 The false claim that the health care law will force Americans to undergo home inspections began circulating online after an Aug. 13 post by blogger Joshua Cook was republished and mentioned by multiple websites. 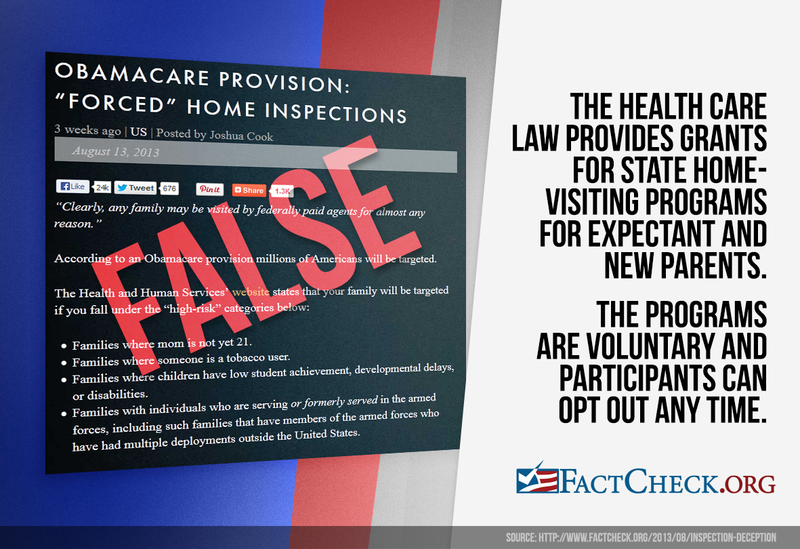 Cook wrote that “according to an Obamacare provision millions of Americans will be targeted” for home inspections. He included a video of South Carolina state Rep. Rick Quinn, during a state House subcommittee meeting in March, also expressing concern over “forced home inspections” under the Affordable Care Act. But that’s not true. The program in question involves voluntary home services for expectant mothers and fathers and those with very young children. Families can be referred for services or they can request them on their own. More important, they can opt out at will. Section 2951 of the health care law amended the Social Security Act by creating the Maternal, Infant, and Early Childhood Home Visiting Program. A Sept. 22, 2011, press release announcing $224 million in funding for the program said that participating families would receive in-home consultations from nurses and social workers who would help families plan to “improve maternal and child health, child development, school readiness, economic self-sufficiency, and child abuse prevention.” The law obligated a total of $1.5 billion over five years to state agencies to expand and improve home-visiting programs for families and children from birth to age 5. The law requires states to spend at least 75 percent of the funds on evidence-based home models that are proven to work for families. The goal of the home-visiting program is to “improve health and development outcomes for at-risk children,” according to the Department of Health and Human Services, which administers the program through the Health Resources and Services Administration and the Administration for Children and Families. However, no one will be forced to participate, according to a spokeswoman for the Health Resources and Services Administration. The programs, which existed in as many as 46 states as of fiscal year 2010, are completely voluntary. Cook, Joshua. “Obamacare Provision: ‘Forced’ Home Inspections.” BenSwann.com. 13 Aug 2013. Unruh, Bob. “Obamacare troops planning home visits.” World Net Daily. 15 Aug 2013. Cook, Joshua. “SC House Subcommittee Gives Favorable Report to Nullify Obamacare (Video).” Greenville Post. 20 Mar 2013. Health Resources and Services Administration. Maternal, Infant, and Early Childhood Home Visiting Program. Webpage. Accessed 22 Aug 2013. Office of the Administration for Children and Families. Affordable Care Act Maternal, Infant, and Early Childhood Home Visiting Program (MIECHV) and Tribal MIECHV. Webpage. Accessed 22 Aug 2013. Patient Protection and Affordable Care Act. Public Law 111–148. 111th Congress. U.S. Department of Health and Human Services. “HHS announces $224 million to support evidence-based home visiting programs to help parents and children.” 22 Sep 2011. Pew Center on the States. States and the New Federal Home Visiting Initiative: An Assessment from the Starting Line. August 2011. Pew Center on the States. Home Visiting Inventory. Webpage. Accessed 22 Aug 2013. Rair, Lesa, spokeswoman, Pew Center on the States. Email sent to FactCheck.org. 22 Aug 2013.